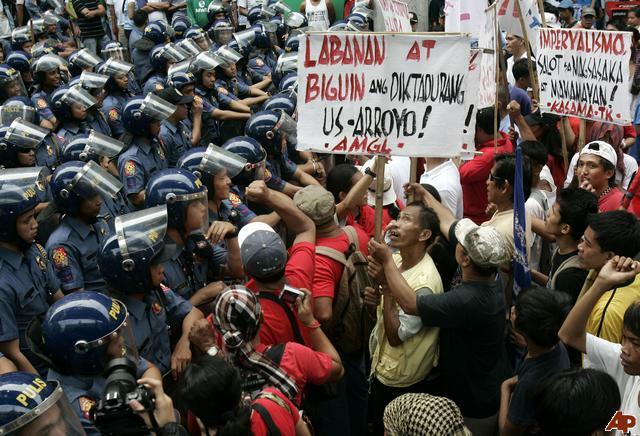 Will A “Hugo Chavez-type” End the Filipino Revolution? UTRECHT, The Netherlands: Jose Maria Sison, the founding chairman of the Communist Party of the Philippines (CPP), made himself clear—he did not endorse Mayor Rodrigo Duterte as his preferred next president of the Philippines. The Quezon City Regional Trial Court suspended work today, as peasants and activists protested on its grounds and called for the release of political prisoners Wilma and Benito Tiamzon. 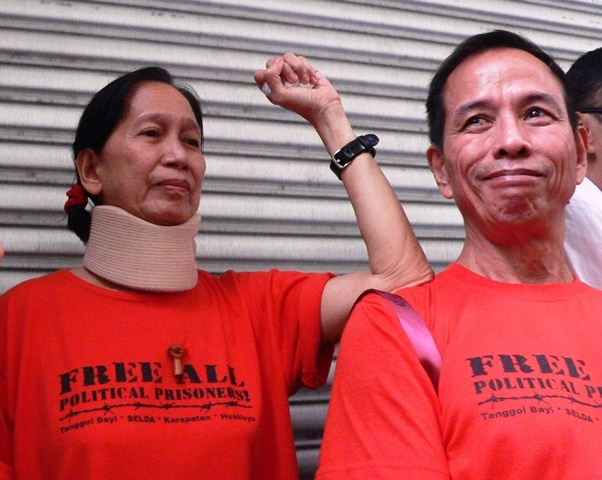 MANILA – The pre-trial hearing of political prisoners Wilma and Benito Tiamzon was deferred today, Oct. 21, as the Quezon City Hall of Justice suspended work for the day at around 8:30 a.m., prompted by a protest of more than 1,000 peasants outside the court. MANILA – The Philippines and the United States on Wednesday opened talks on increased American military presence, amid protests by leftist groups warning against foreign interference. 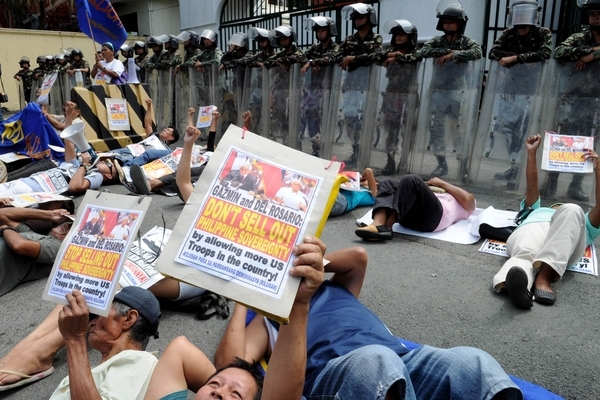 Activists picketed the principal military base in Manila, where the first round of negotiations on a “framework on increased rotational presence” was being held. MANILA — From the fist-pumping crowds to the anguished dictators, the pro-reform revolts reshaping Arab history resemble the Philippine uprising that booted a strongman 25 years ago. But the similarity ends with the killing of protesters from Tunisia to Libya. The four-day “people power” revolt a quarter century ago that Filipinos commemorate this week saw multitudes of civilians and rosary-clutching nuns and priests mounting a human barricade against tanks and troops to bring down dictator Ferdinand Marcos with little bloodshed as the world watched in awe. The democratic triumph has been hailed as a harbinger of change in authoritarian regimes in Asia and beyond. Since then, democratic revolutions have ended autocracies and military rule in South Korea, Thailand, Taiwan and Indonesia in relatively peaceful feats that seemed unimaginable before 1986. But the Philippines also became a showcase of post-dictatorship pitfalls that revolt leaders say could provide lessons to Arab nations, which will have to grapple with daunting uncertainties once the euphoria wears down. 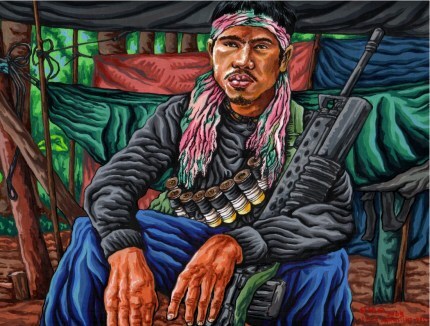 THE government and the Communist Party of the Philippines-National Democratic Front have agreed to sign a final peace agreement by June 2012 to end the communists’ 40-year insurgency. In a joint communique, government chief negotiator Alexander Padilla and his NDF counterpart, Luis Jalandoni, said both sides agreed to finish drafting agreements on socio-economic, political and constitutional reforms, and on ending hostilities and the disposition of forces, within 18 months. 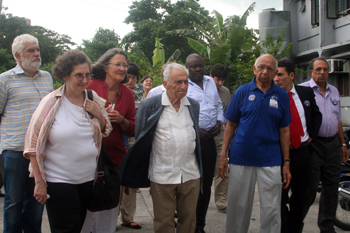 The two sides issued the statement after a week-long negotiation in Oslo that ended a six-year impasse after talks bogged down in 2004. [The Morong 43 are health workers who were arrested in February 2010 by units of the Armed Forces of the Philippines while they were attending a seminar in the coastal town of Morong in Rizal Province. The army accused them of being members of the banned New People’s Army.–Frontlines ed]. The Communist Party of the Philippines (CPP) today welcomed President Benigno Aquino’a order for the Department of Justice to withdraw charges against the Marong 43 as a boost of goodwill for the forthcoming resumption of peace negotiations. Formal peace negotiations between the Government of the Republic of the Philippines (GRP) and the National Democratic Front of the Philippines (NDFP) are scheduled to resume in February 2011, in Oslo, Norway. The withdrawal of charges against the Morong 43 is expected to be finalized by the DOJ [Department of Justice] on Monday and pave the way for the immediate release of the detained health workers. Aquino’s order came weeks after repeatedly insisting that he cannot do anything except to await the court’s action, despite recognizing defects in the arrest of detainees and despite the fact that they have yet to be brought to court. Calling the Aquino government as a “haciendero regime” and the “number one enemy of peasants,” progressive farmers’ organizations from Central and Southern Luzon would converge at the office of the office of the Department of Agrarian Reform before marching to the historic Mendiola bridge on October 21. The Peasant Week is annually observed by progressive farmers’ organizations to renew their vow to fight for a genuine agrarian reform program that will solve the centuries-old land problem in the country. The theme of this year’s peasants march is “Lakbayan ng mga Magsasaka Laban sa Hacienderong Rehimen ni Aquino” (Long March of Farmers Against the Hacienda Regime of Aquino). At the north leg of the march in Luzon farmers would hold their first vigil in Tarlac on Oct. 18 while the Southern Tagalog Wing 1 and 2 would hold their vigil in Alabang and Batangas, respectively. The different groups are expected to converge at the Department of Agrarian Reform office in Quezon City on Oct. 21 before marching towards Mendiola in Manila.